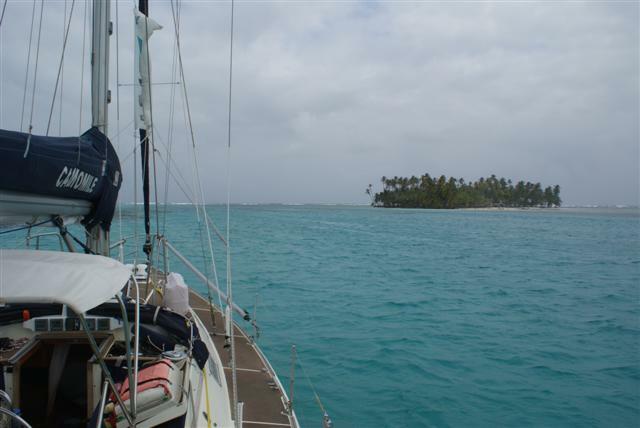 ← The worse 48hours of our sailing life – so far. 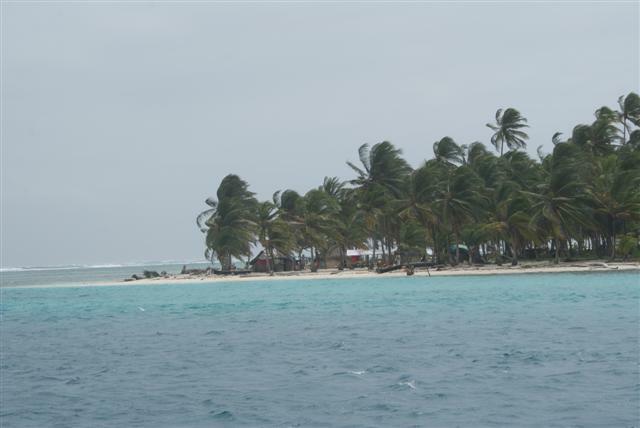 After our horrendous journey of 5 days of total purgatory we arrived at Pourvenir in the San Blas islands with 14 other BWR boats to check in with customs. Even in this remote part of the world we still had to check in with customs and get our passports stamped. Pourvenir is just an airstrip, the customs office and a very basic hotel. That evening we all went ashore to eat in the little hotel. The choice was chicken, rice & chips or fish, rice & chips. As the chickens were still running around round the back we decided that would be the freshest! We had a party to celebrate arriving safely. 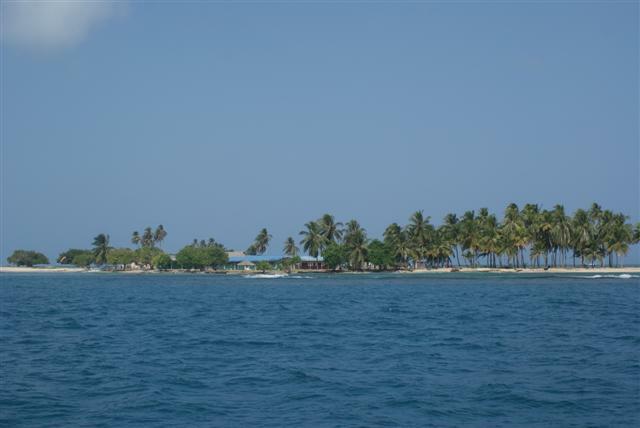 The San Blas islands are a vast archipelago on Panama’s Caribbean coast. Home to the indigenous Kuna Indians it is one of the most untouched stretches of virgin rainforest and a cruising ground of incredible beauty. 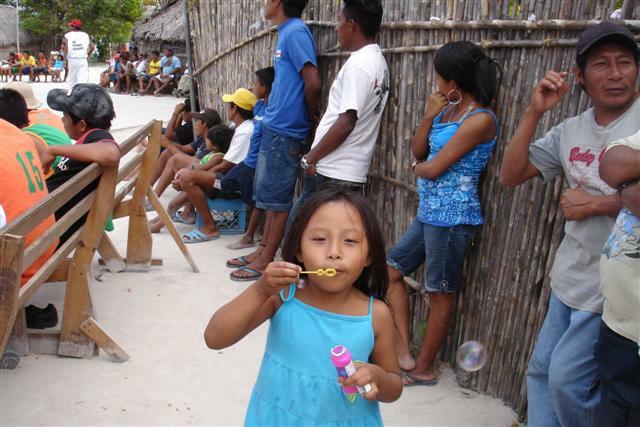 The kunas don’t like the name San Blas, given to them by the American’s, and prefer Kuna Yala, their own name for their land. The land is not divided into individual properties and fences are absent. The Kunas accept visitors but intermarrying is forbidden and foreigners can’t buy land or invest in Kuna Yala therefore it remains unspoilt. We visited the island of Nalunega to meet the Kunas with the crews of Enchantress, Bali Blue and Miss Tippy with their children. The Kunas are physically small but they are peaceful and crime is extremely rare. The woman dress in very colourful, handmade clothes called Molas, which they were also selling. They have a strict hierarchy of tribal leaders and the chief or Sailas holds the highest authority. Sailas are more than leaders they are also holders of medicinal knowledge and history and they sit every evening in the Congresso surrounded by the people, woman and men, to discuss complaints or ideas. 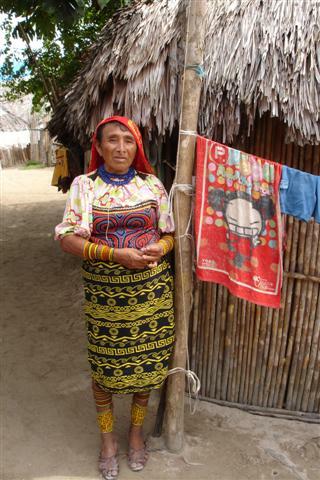 Kuna Yala is a matrilineal society, the women control the money and the husband moves into the woman’s family compound. Nesta, a young man who spoke some English and who was keen to show us around his village, met us on the beach. 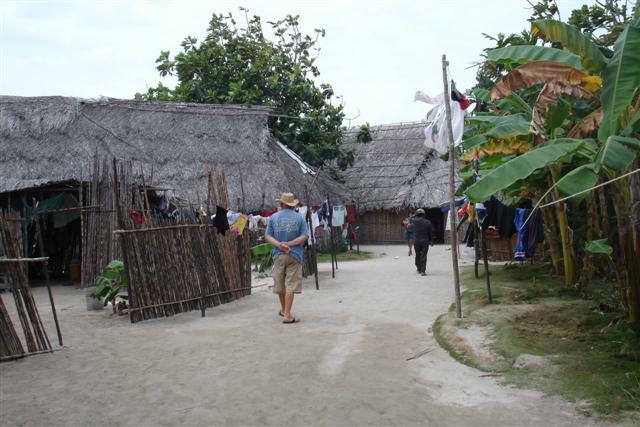 The huts are made from renewable, fast growing materials; the floor is slightly elevated with compacted sand, while the walls are made of cane. The roof is made from a palm leaf found in the jungle. There are no nails, everything is held together by jungle creepers, and remarkably they remain dry when it rains. 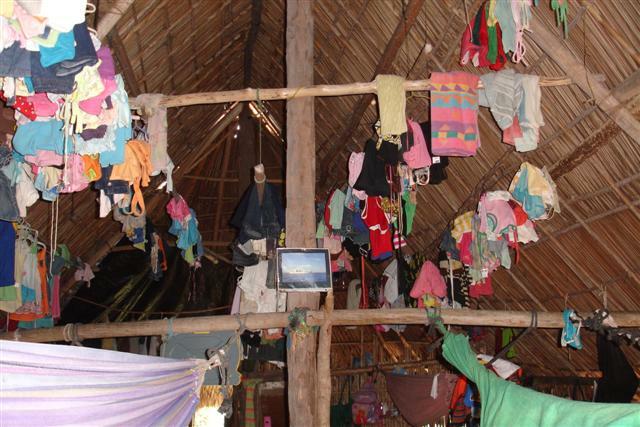 Nesta’s home was very sparse with all their clothes stored in the rafters. There was a screen in the corner with a double bed behind it but the mattress was falling to bits and the pillow was very dirty, there was no sign of any sheets. The rest of his family sleep in hammocks of which there were about a dozen or so hanging from the rafters in the one hut that he shares with 3 generations of his family. Nesta’s wife and 2 small children were sitting swinging in a hammock, they were all smiles and happy for us to look around, they appeared to have so little, maybe we all have too much? We had all taken gifts for them, Shelia took a bag full of clothes the girls had grown out of, we took bubbles and trinkets for the children, and others took chocolate. Although they didn’t have a lot they were very happy and welcoming people. It made you feel very humble. 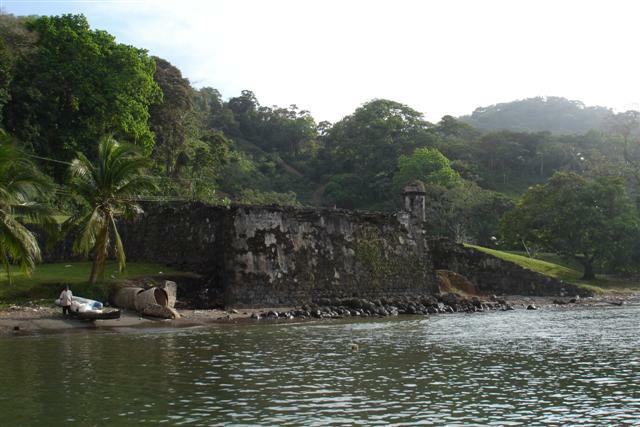 We had a further 5 days to explore some of the other islands, many of which are uninhabited with just a covering of Palm trees. 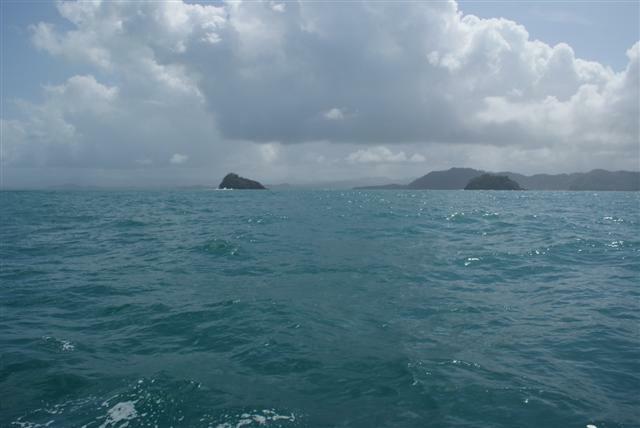 We sailed over to East Holandes Cays some 20 miles East and anchored in ‘The swimming Pool’, a wonderful anchorage with water the colour of a swimming pool and so clear you could see to the bottom 3M down. That evening we joined some of the local liveaboard cruisers on ‘Barbeque island’ for the weekly cruisers barbeque. We spent some time snorkelling in ‘The hot tub’, which had one of the best coral gardens we had seen. 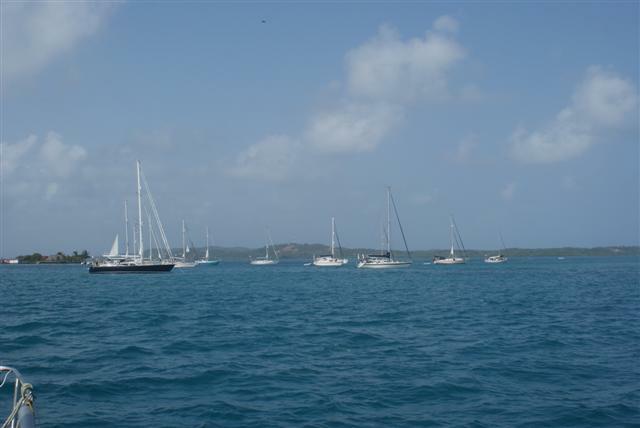 We made our way back to Chichime Cays a lovely protected anchorage. David and Susan arrived on Enchantress with a huge Tuna they had caught. After Bill and David had finished butchering this poor thing into steaks Susan and I made a delicious meal with marinated tuna and roast vegetables. The next morning we left to motor the short distance back to Porvenir to check out and collect our zarpe’s ready for the next port, when we were surprised to hear the smoke alarm going off below. On closer inspection I found the aft cabin full of smoke, which turned out to be exhaust fumes. Bill stopped the engine and looked in the engine bay to find it full of water, we were sinking! I started pumping the manual bilge pump while Bill ran round to find out where it was coming from. After lifting the floorboards he found a split in the exhaust muffler. He clamped it temporarily with molegrips so we could continue to the anchorage. Once there he removed it and bound it up with aircraft tape and cable ties until we can get a new one. There was a mass exodus of BWR boats the next day bound for Portobello. It was 53 miles along the coastline. We started off with a reef in the main and 2 turns in the genny because this was the first time we had been ‘outside’ since our awful journey from Bonaire. We needn’t have worried because it was a beautiful day with a lovely F5 and we had a great sail. Bill was pleased because we managed to keep up with Enchantress and then started beating them and they are a bigger lighter boat. We anchored in Portobello at 16.00 and invited David and Susan on board for a return meal. The next day Saturday 6th February we all went ashore and were picked up by Richard from BWR for the first briefing of the newly formed rally. We were now 25 boats and the rally was almost complete. We were taken to a restaurant in the hills for the meeting followed by a lovely meal in the garden. Although we had met a lot of the new crews already it was great to all sit down together. We discussed the transit for the Panama canal and how it was all going to happen. There were going to be exciting times ahead. Posted on February 6, 2010, in Port posts. Bookmark the permalink. Leave a comment.